Have you ever wondered what your local law enforcement is up to? Well if you live in Buchanan County Missouri, you dont need to wonder any longer! This app will launch a scanner feed for the Buchanan County Sheriffs Office, St. Joe Fire and Rescue, and Heartland EMS, and you can listen right from your BlackBerry! 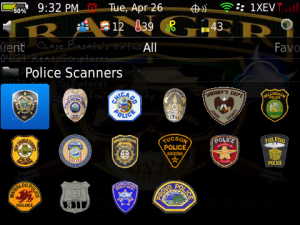 If you would like a Police Scanner for your local Police or Fire Departments, EMT, or Airport, click the Contact the Developer button at the bottom the this page and let me know! I cant provide scanners for the UK or South Africa. If you get an error message and have a 8530 or 9630, you probably need to update your OS. The scanner feed is provided by RadioReference under a creative commons license. Use of police scanners may be restricted in your area, please check all applicable laws. Be informed of your missed calls and who it was from without activating your device. © Copyright Free blackberry Apps download 2019. All rights reserved.